The principle of airflow is used to effectively exercise the respiratory muscles of the lungs. Every breath during training is stronger, more stable and more effective. The increase of breathing depth means that both physical strength and resilience have been greatly improved. Breathing movement mask is a key part of your fitness training, so that training can reach a completely new level. The new front rotating knob can adjust the resistance more easily. No need to pick the mask to replace the expiratory valve. Just adjusting the level can create different air resistances from easy to difficult. The 6-level air resistance intensity can reach different training intensity. The 6-level simulated altitude pressure is 500M/1000M/3000M/4000M/5000M/6000M from low to high. The mask consists of four parts which are mask cover, flux valve, control air flow level and flexible mask body. The mask is made of silica gel and cotton fabric elastic fabric. It is soft and breathable. Even if it is close to the skin, there will be no discomfort. The lung capacity is effectively increased. When you exercise in the absence of oxygen, your body will breathe deeply and improve your lung capacity. Six-level switch is installed in the mask to simulate the air pressure at different altitudes. The lowest simulated altitude is 500M, and the highest simulated altitude is 6000M. You can choose different switches according to your physique. It is widely used. This mask is suitable for a variety of fitness occasions, both indoor and outdoor. 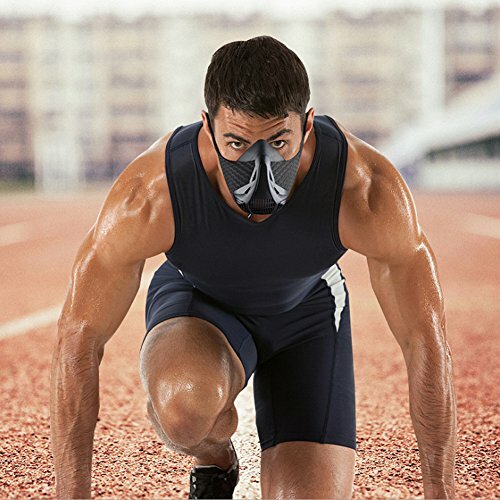 Whether running, cycling, rock climbing or indoor fitness can be combined with masks. The size of the mask is uniform, which is suitable for most people. The end of the mask is with a magic stick, and you can adjust tightness.